European Union officials are examining legal options to side-step a possible British veto on the bloc's long-term budget, in a bid to weaken Prime Minister David Cameron's trump card in the talks, diplomats said. Britain is one of several net contributors including Germany and France demanding deep reductions to EU spending plans worth more than €1 trillion between 2014-2020, which they say are at stark odds with austerity-driven spending cuts at home. Under pressure from Eurosceptics in his own party to deliver a real terms cut, officials believe Cameron is the most likely to make good on a threat to veto a deal at a summit of EU leaders in Brussels starting next Thursday (22 November). Germany and others fear that would throw future EU spending into chaos, distract from more important efforts to shore up the faltering euro zone and undermine market confidence in Europe at a sensitive time. "The British are the only ones who consider it potentially acceptable to pull everything down around them at the summit," said one EU diplomat, speaking on condition of anonymity. "The EU institutions are thinking of ways legally to get around a British veto," he said. If there is no deal on a long-term budget, EU governments would have to set annual budgets based on 2013 spending with a 2 percent increase for inflation, which could end up costing Britain more in net contributions than at present. Crucially, such annual budgets only need the approval of a weighted majority of EU governments, meaning Britain wouldn't hold a veto. The approach would be complex and raise legal questions over funding for multi-annual EU projects, but the presidents of the European Council and European Commission believe the alternative could be years of deadlock, one official said. "They are telling people that there is no way out if there is not an agreement next week, and therefore it's vital to get some sort of deal," said the official, who asked not to be named due to the sensitivity of the issue. "In this context, they are having to examine other options for the budget." While EU officials draw up contingency plans for a possible British veto, Germany remains focused on trying to find a compromise seven-year deal that Cameron can successfully sell to sceptical British lawmakers. British officials have been vague on the exact figure that would satisfy their call for a real terms freeze in EU spending, which negotiators hope will leave Cameron some wiggle room at the summit. 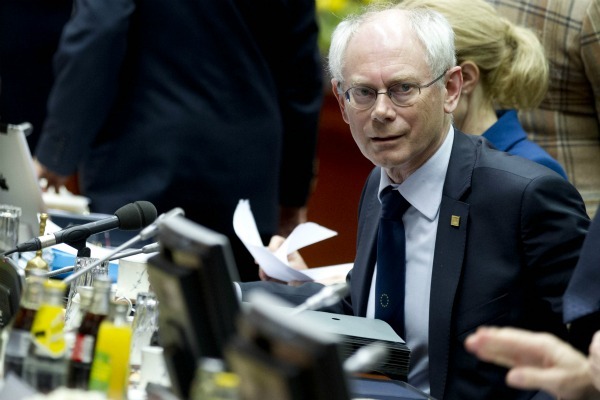 European Council President Herman Van Rompuy took a step in Cameron's direction on Wednesday, when he proposed to trim about €80 billion from the spending total and maintain Britain's EU budget rebate, first won by Margaret Thatcher in 1984. But the cuts are unlikely to be enough to satisfy Britain, Sweden, the Netherlands and others, who have called for reductions in the range of €100-200 billion from the European Commission's original blueprint. Some officials involved in the negotiations say leaders will need to find about €20 billion in further cuts to meet the bottom range of reductions demanded by the main budget contributors and head off a British rejection. That would increase the likelihood of a veto by France, which is already furious at deep cuts to farm subsidies in Van Rompuy's proposal and fears more reductions in agricultural spending as leaders chip away at the total figure. "This proposal in no way constitutes a basis for negotiation that is acceptable for France in terms of ceilings on spending proposed for the common agricultural policy," French Prime Minister Jean-Marc Ayrault said in a statement. Further cuts to EU cohesion spending – used mainly to fund infrastructure projects in poorer eastern European member states – could also stiffen opposition in countries such as Poland, Hungary and the Czech Republic. But officials believe it will be hard for the biggest beneficiaries such as Poland to veto a deal, and they say France is far less likely that Britain to derail the talks. "France would find it very hard to veto if Germany and others are ready to do a deal," the EU diplomat said. At roughly €130 billion a year, the EU's annual budget is equivalent to around 1% of EU national wealth, or €244 per EU citizen. The European Commission proposes raising it to an annual €146 billion over the next seven-year period (2014-2020), or €1.025 trillion in total. I’m British too, and I was under the impression that the EU sang the praises of the rule of law. But this attempt to break the spirit of the law using technical means shows how wrong I was. Germany is making a big mistake by trying to use the same tactic as in the eurozone crisis: dictate the rules by making money scarce. This is a mistake because the EU budget is much smaller and because if the talks fail, then there is still an annual budget (voted each year by qualified majority, which I find much moredemocratic that a horsetrade every 7 years). In fact, the UK made us all a favour by revealing that there is still an annual budget and therefore that the empress is naked. The EU is now made up of countries scrounging off others. Is this what people want – nations full of scroungers? I want all the countries of Europe to be proud of their own countries and stand on their own two feet. One thing that would help – get rid of this political elite; no wonder our pensions and wages are disappearing – we’re all having to support this unwanted, self-important, and costly bureaucracy. The only way OUT of this is for UK to finally get OUT of the train wreck that is the EU and once again be free. Then the EU can be free itself top borrow and print money ad infinitum and drive itself into penury whilst UK succeeds as a World Trader. I’m British to and I make no apologies for the view my government is taking. On the contrary, let them screw the EU for every penny it can get – my only complaint is they are not disruptive enough in the negotiations. I’m British too, and I’d like to disown Matthew. He doesn’t speak for me, in fact he is in a small minority in this country. I hate the EU with a passion, for its corruption (accounts rejected by the auditors for 19 years in a row) but most of all for its blatant disregard for democracy (ignoring any referendum result it doesn’t like, or ordering it to be re-run until it gets the ‘right’ answer). This story shows that once again the unelected officials who run this monstrous organisation want to find technicalities by which they can ignore the principles that supposedly control it. There is no ‘European electorate’ so there can never be a ‘European democracy’. Democracy is based on the inalienable rights of the people of a nation to choose their Government, which Government will then use the power lent to it by the people for a maximum term before submitting itself to the judgement of the people once again. No elected Government has the right to give away the powers lent to it by the people, therefore all power claimed by the institutions of the EU is illegitimate. Most of the British want to leave the EU, and it seems that many within the EU want us out too – except when they look at our net financial contributions. I cannot think of one Company or Conglomerate that has gone nearly 18 years and not had its accounts signed off by auditors. This is one huge gravy train and the only reason some British politicians are still supporting it is because they hope to be part of that gravy train one day. I am British, I love the people of Europe but I do not want to be ruled by them or be part of the EU. A lot of Britons feel the same way. What we signed up for back in 1978/79 was a Trading agreement. I have not been asked to vote for anything else since and therefore you have eroded my personal freedoms and I resent it fiercely. Keep your EU but let our people go. Adrian, I’d be quite happy if you disown. I never said the EU was perfect and I don’t pretend the majority of the UK population want to be a part of it. What viable alternative to EU membership and working with our neighbours would you suggest. Would like the UK to go back to the days of Empire? Rather than get angry and ‘disowning’ someone that doesn’t share your view, why not offer a few suggestions as to how Britain could successfully go it a alone. The Commonwealth, the Pacific Rim, China, the U.S. – all are markets we have successfully dealt with and the Company I worked for sold more to them than anyone in Europe. We could go it alone – we could even sell into Europe because the Norwegians do and they had the uncommon good sense not to get involved with the EU. I cannot understand people who think we are dependent on Europe for sales. Norway is not part of the EU but is subject to around one third of the regulation of full EU members. It is part of the EEA, which allows for the free movement of goods, services, persons and capital. Norway is a rich country due to the huge oil reserves, timber and fish exports. Much of what it exports is also subject to EU import/export tax. So, if the UK followed the same model it would also be subject to similar costs. The UK already trades with the likes of China, the US and other emerging markets so what’s the difference? The UK is a strong and influential country and could be leading in Europe. Surely it’s better to be at the table with a strong bargaining position than have no say whatsoever and still be subject to a third (assuming like for like with Norway) of the rules and regulations? It is not true to say that such an approach would violate the rule of law, as the Treaties clearly specify what would happen if there is no multi-year budget deal, ie rolling over last year’s budget year by year, as is being contemplated. Before 1984, this is what always happened. A further point though is that the EU cannot amend its rules on revenue (which apply indefinitely unless amended) without all Member States’ consent – so the current top limits on spending, and the current rules on the British rebate would apply, because the EU has to balance its budget, so in principle cannot spend more than it takes in. I think politically a better solution (although it really would raise novel legal questions) would be to agree a budget of eurozone countries alongside the EU budget – although for pragmatic reasons this would probably have to extend to some non-eurozone countries like Poland which receive cohesion money. Hi Matthew, you have said it yourself, the UK is a strong and influential Country. I am sorry but I don’t believe we will ever be leading in Europe and yes I know Norway pays to export goods into Europe – which they still seem to think is a better option than joining. Europe keeps expanding by allowing poorer Countries to join which the rest of Europe is expected to cover by increased fees for the pleasure. My son had his own building business but they could not compete with people who will work for peanuts and sleep in their cars – nobody can. We have lost certain rights with our laws and quite honestly Britain is poorer for it. I’m sorry but you will never convince me that anything good comes out of it compared to what we have lost by joining. It’s nothing personal Matthew but I am for leaving it and the sooner the better. Sorry. I am English I am British I am from United Kingdom, i am not from Europe I hate the European Union and hate the European Parliament. And I would do anything in my powers to destroy it !!! I will 100% be voting UKIP. I’m an American. The UK should leave the EU. The EU has morphed from an organization of sovereign nations who meet to discuss ways to liberalize trade, etc. into a giant welfare bureaucracy. Furthermmore, the EU is hostile to America. The EU bureaucracy itself is a parasitical class which n seems determined to place entire countries on welfare. Get out and seek better relationships with the rest of the world. Yes, the answer is that the UK should leave the EU. Please go away and stop interfering and blocking what the other 26 are trying to do. Ever noticed that the UK is practically isolated? Do you really think this is because 26 other countries in Europe are idiots and the only intelligent one is the UK? And for those who go on about Norway, it is in the Schengen zone, as are Switzerland and Iceland. If the UK wants to be like Norway (the most expensive country in the world) then perhaps it should join Schengen. But, please get out of the EU first. @ Adrian and @ Vicky George. Well said guys, absolutely spot on! @ Matthew – I am sure that we will rise above your negative thinking and make a way for ourselves in the big bad world. The Swiss have all the advantages of commercial access without the costs of full membership, while participating in the single market, free movement of goods, services, people etc. They are also outside the CAP and pay nothing like we do for the privelige. As I understand it they are also free from a lot of the rules and regulations that come out of Brussels. Sounds good to me. Remember that all this grief has been exallerated by the Eurozone trying to fix the current disaster that is the Euro. The introduction of the Euro was mismanaged from its inception and to fix it will require banking and political union. Many in Britain feel threatened by this and fear what may become of them if they get swallowed up and diluted in a Federal state which has 500 heading to 600 million people. This not what we thought we were joining back in 1973 and indeed when the referendum was held in 1975 we were told ‘don’t worry, it’s a trading club’. We should look to the developing countries of the world for our future trade as I believe that the EU is only going one way and regrettfully that is down. Before someone comes back and says that we will not be able to trade with the EU think on how much business individual countries do with the UK (more than we do with them) and whether they will be prepared to lose that. The future United States of Europe is an artificial construct and will never gain the loyalty and respect of the member countries citizens. Its time to come out! Wow, you British Eurosceptics are proper haters, aren’t you? I believe in a united Europe (however flawed) and ultimately as united humanity. I believe in European countries working together for a common good and I believe in an EU where nation states are exactly that: states that make up a bigger whole. States that have their own language, customs and traditions and states yet realise they are part of a larger community. I’m not so delusional as to think my country is better than any other country. You mention Iceland and Norway but you realise they are part of Schengen? That means you don’t need a passport to move from country to country. Norway, which isn’t part of the EU, is more open to Europe and is more integrated into Europe than the UK is. I am British and I say yes to Europe and the EU. I say oui to Europe and the EU. I say ja to Europe and the EU. I say sim to Europe and the EU. I say já to Europe and the EU. I say ??? to the Europe and the EU. Well said George Mc. Back in 1978/79 I voted yes to a Free Trading Agreement, a Common Market as it was then. At no time since have I ever been asked to vote for a European State and I most certainly would never have voted for such a sad state of affairs. Our successive Governments have sold this Country down the river in the hope that one day they might clamber aboard the non-accountable gravy train. This was once a free Country and whilst there is breath in my body I will campaign to keep it so. @Steve Peers. Do you think that the UK’s position might be convenient for other member states, in the sense that they might share it but find it impolitic to say so? Hoover, I am not Steve Peers but I doubt very much that other countries “hide” behind the UK or share the UK’s position (which countries? Italy, in a similar status as a net payer to the UK, has made it very clear it wants nothing to do with the UK’s idiotic position. Other countries are able to make their opinions clear). The negotiations for the budget are not a joke, they are a serious matter and the implications of a failure to reach an agreement very serious too. Let’s not forget it was a British prime minister who vetoed the last budget (Blair in 2005). This is the only contribution Britain can ever make to these negotiations. The solution is for Britain to leave the EU and stop being a pain in the backside for everyone else. You accept that the EU is not perfect , but you accept the status quo , contributing no suggestions as to how the EU could or should be improved . Britain’s trade with the EU is about 40% , of which Britain usually imports more than she exports , so a trade tariff would be beneficial to Britain . Britain’s profitable trade is with the rest of the world , about 60% . I would not suggest that Britain , as a free sovereign country, should have a relationship with the EU the same as Norway . On leaving the EU Britain should wipe the slate clean ; beyond trading , Britain should agree to only the barest minimum to keep on friendly terms with Europeans as opposed to the EU . Britain’s referendum in 1975 on whether to remain in or leave the EEC , gave no hint that the EEC might eventually become the EU . That was kept a secret and we the people were deliberately lied to . There should have been a Europe wide referendum in 1992? on the creation of the EU ever closer union . The EU has NO DEMOCRATIC mandate to assume government on our behalf or that of any other member state . Mathew , I suspect that you favour the EU as a political theory ; but with no real input or practical experience . I , as an ARCH EUROSCEPTIC have been traveling in Europe since before Britain joined the EEC . I have lived a number of years in Italy , where I have many friends and I speak Italian fluently . I have friends from nearly every European country , yet I am still opposed to the EU and voted for Britain to leave the EEC in 1975 . People across Europe are vastly different in their customs , culture , ecomomy , self government . Trying to stuff us all into one package , one rule , one currency fits all , shows a lack of vision and understanding . The EU has become a MONSTER that we the people have no control over . The single currency , is in my view , the nail in the coffin ; because it has destroyed the very thing upon which the EU was based , namely trade . Countries like those of southern Europe with lesser economies cannot compete , when they share the same value of currency with Germany . As things stand the EU internal market is dead and has no prospect of ever resurecting while the Euro exists . To argue that full political unification will overcome this problem is nonsense . An EU with a transfer economy , means that more prosperous countries work their Butts off to support the lesser economies . The result would be all countries sharing a lower standard of living , rather than the reverse . Arguments that Britain should be at the centre of the EU giving a major input and leadership , are only aired by those who have no knowledge of complete EU history . Britain has tried and tried to give leadership , but the EU is France and Germany’s baby and no way are they going to allow Britain to take them off their predetermined course . British people never wanted to join the EU , as opposed to EEC . John Major proposed the expansion , that the EU now has , but he recommended that the EU should become a loose association of Nation states along the lines of a commonwealth . That was not part of the original plan , designed for 6 adjoining countries that had all been defeated and occupied during WWII . Dare one say , too many cooks spoil the broth ; the mismatched combination of ingredients that the EU has become are a disaster . All Commission efforts to remedy the situation only make it worse . It is not true that a politically and economically united EU is the only way forward . Britain should leave the EU let the mainland people do it how they like . I do not believe separation will effect Briain’s trade with EU countries . Britain has historically traded around the world and still does . I know you’d like to throw in Britain dreaming of re-finding her lost empire , but we all accept that that is dead and buried . We europeans even know that not all British-Europeans are Skeptic ! No ! Completely beside ! Europe IS very PRO American !!! Maybe You think Chinese are Americans allied ! What a nationalism morass !!??? I’am I’am Iam…..
What Do You think what happens ???!!! Even Scotland don’t want YOU ! They prefer rather leave the United Kingdom an join the EU ! Now Farage don’t want even Scotland leaving the UK!!! This is a contradiction to his party ! Farage don’t even know what HE want besides smelling honey to innocent British Europeans ! Sorry! He had better shut up and let finally Europe Reunifying as Winston Churchill Victor Hugo and even George Washington said ! I think there is only 1 fear to UK ! The Superpower of Europe …. Whoever said the negotiations were a joke? I’m sure they’re deadly serious, but I’m realistic about how member states behave and I’m less persuaded that it’s always in good faith. Having worked in Brussels and watched how MSs manoeuvre to gain advantage even on trivial matters, I’m appropriately cynical. It was always interesting to see them make earnest protestations of their honesty with perfectly angelic expressions on their faces. We live in straitened times. Governments are currently *desperate* for money, because spending = votes. Why would they not be reluctant to reduce their contributions to Brussels? Time is past due for Britain to LEAVE a Union it never really endorsed. Britain ought to be free to do its own thing while keeping the Wall st. Toadies, such as Blair, and the “CITY” financial services toadies, such as Cameron, out of the affairs of a Continent that has different problems and ideals than the insular Brits. No it’s not artificial why ? WORDS are artificial: Country states territory and son on but not the political system with dual federalism as the United States! Even they have a state identity on their cards and a flag on each state!! Indeed United states of Europe will come now ! That is the Reunification of Europe after the very bad World War 2! If you have a different point of view than the majority of the posters on here, that is fine, if however you want your post to have any credibility try arguing your case with accurate facts. You said Quote Now Farage don’t want even Scotland leaving the UK!!! This is a contradiction to his party ! Farage don’t even know what HE want besides smelling honey to innocent British Europeans ! Sorry! Unquote. Try a little logic here! Farage is in UKIP, the clue is in the name, UNITED KINGDOM INDEPENDENCE PARTY. Now Scotland is part of the UK and as such Mr Farage wants the UK to leave the EU. Nothing illogical or contradictory there. Many pro Europeans quote Winston Churchill who was in favour of the countries of Europe forming an alliance, but conveniently forget to remember that he said in the same speech that this would not be for the UK. What Victor Hugo and George Washington have got to do with this is I am afraid a bit of a mystery to me. Quite simply put you are trying to falsely construct a Federal State from disparate nations whose citizens have not given their consent. Where the language, culture, beliefs and law to say nothing of religion or ethnicity are so diverse that we don’t have loads in common, apart from the obvious. You mention the USA having different states etc. but that is no different from my country (and yours) where people have a regional identity as well as a National Identity. It has taken the USA over 225 years to get to where they are today and no one could argue that they do not have a very strong sense of National Identity (some may argue overly strong). The point however is that the USA was constructed by British exiles speaking English and therefore understanding each other. You have only got to refer to this blog site to see what a hopeless and sometimes impossible task that is. The UK is probably about to opt out of the European Justice part of the Lisbon treaty. Your must remember what a huge change that could have brought to UK law by 2014. Britain uses common law, where the defence and prosecution argue out criminal cases before a neutral judge and jury. The criminal law of most other EU countries is based on a mix of Roman law and the Napoleonic legal code, amongst other influences such as national constitutions. Sorry United Alliance but the EU wants to interfere in every part of our every day life and destroy our culture and National Identity. Aha! Who said that the federal State or the political system will Interfere to culture and Identity !?? Sorry but sine the Euro as Draghi said is Irreversible there is only the federal way to rerise the economy and fight against jobless! The Federal Way doesn’t does not necessarily mean an U.S.E ! Maybe a Confederation or United Countries! Sorry George Mc but the EU doesn’t overcome the federal Way nor will this coming political structure interfere the “Nationalism” of this generation. Will the British “eurosceptics” ever contemplate why it is only their country that takes these anti-EU positions? It is only their citizens who come out with such polemics. You are isolated and no one else in the rest of Europe shares your view. And don’t point to a few polls where some crappy parties like the True Finns do relatively well (and even they don’t have the same position as you on the EU). You “eurosceptics” have predicted so many times that the European people are going to rise up against the EU and somehow ally with you, yet these predictions have always failed. The UK view is isolated in the EU. No one agrees with you, neither the politicians or the people. Why do you think this is? And, will you ever acknowledge this reality? Do you remember when the former Communist countries joined the EU and you deluded yourselves into believing that they would “side” with you against France and Germany and the “old” EU countries? That turned out to be a completely wrong prediction too, and they are now the ones who are furthest from you on the budget negotiations. And, for those who think the UK would do fine outside of the EU, perhaps you should also contemplate that it only seems easy for you today to trade with non-EU countries and even with EU countries precisely because the UK is in the UK. If the UK left the EU then you would have to arrange your own trade and tariff agreements with other countries, and it would be far less easy for you to get favourable terms with China or South Korea or Brazil with the UK negotiating on its own as opposed to the whole EU negotiating. And, the UK will also be much less attractive if it were not a member of the EU to foreign investment, even the City will suffer as a main reason it is such a “leader” is because it is in the EU. But, you are so arrogant you think the rest of the world will just come running to the UK and be so on its knees for trade with the EU it will let you dictate whatever terms you want. Reality, however, is very different. The UK attacked and derided all the efforts at European integration from the Messina Conference in 1955 to the foundation of the EEC in 1958 and everything after, yet it felt obliged to join in the end because it suffered from remaining outside. Instead of joining at the beginning and helping to shape the evolving EEC it joined much later but could only ever complain about the terms of membership, despite not wanting to shape what membership meant. Please hurry up and get out, and then see how much you really like it. I have never understood the hatred towards people, such as myself, who simply want to be independent. All of my life I have worked hard and stood on my own two feet; I wouldn’t dream of begging from other people. I’ve always believed in a democracy where I can vote for somebody to go to my Parliament and make my laws – free from outside interference. Would the people on this thread deny Palestine or the South Africans their state of independence. I have observed the EU grow – I have gone from being moderately pro-EU to fanatically against. The bigger the political class becomes the further into decline fall the ordinary people. The people on here who defend the EU are most probably amongst those who gain – I and my friends and family gain nothing but debt. Wg, what’s really incomprehensible is the bizarre hatred towards the EU by many vocal British. Can you explain that? Your comparison of the EU to the situation of the Palestinians or South Africans is truly offensive, for example, not just to Europeans but for your trivialisation of what the Palestinians and black South Africans have had to go through. This distorted thinking that you present is at the root of the extreme hostility of many in Britain towards the EU. Your personal and family debt are nothing to do with the EU and everything to do with decisions your own governments made and the way in which your banks were giving out mortgages and credit cards. And, enjoy trying to work hard and stand up on your own two feet or surviving without having to borrow more and more with your country outside of the EU. I can assure you it will not be as easy as you think. My goodness, where to start. I was merely pointing out that Palestinians and South Africans want their independence – the same as I do; I wasn’t comparing the two situations. My “distorted thinking” is very clear thank you – I don’t wish to pay for another government – which brings me onto your third point. My pension has disappeared, my wages frozen for the last four years, and my utility bills rise exponentially – just as millions of others in the EU who are now experiencing hardship. At the same time it is apparent that we have a growing political class in Brussels who are beyond this austerity – more glass palaces, more six-figured salaries and pensions to match, more foreign junkets, all ferried around in chauffeur-driven cars. As for surviving outside the EU – I believe that Britain can do it. I would much rather live in poverty and be independent, than be pampered by borrowed money and dependent on the likes of Barosso and van Rompuy. Of course, if Britain were to leave the EU we would have to face up to the vitriolic outpourings of those who would have lost control over our lives, but I am confident that we could overcome that and come to a different arrangement. The EU has no right to have any control over me. That is absolutely nothing to do with the EU and more to do with the global slowdown, which every region in the world is experiencing. But, it could be argued that part of the reason for this is the deregulation of the financial industry that the UK was extremely active in getting the rest of the world to go along with. And, the City of London has produced much of these hedge funds, banks, credit lenders, etc. which led to the boom in debt, and the whole trend towards huge bonuses. That’s nothing to do with the EU. So, your arguments are inconsistent – you blame the EU for increasing poverty then you claim that you would be happy to be poor if you could at least be outside of the EU. As for borrowed money, the UK government was quite happy on its own to borrow and borrow, UK banks all on their own lent to UK citizens who could never afford to pay back. And, it’s no surprise that you don’t have a clue what Barosso and van Rompuy actually do. Wow, histrionic or what? If your country is an EU member-state then your country has agreed to follow certain policies that have been decided upon in negotiation with all the other member-states. Just like your country is a member of the UN, Nato, the WTO, the Council of Europe and a whole host of other organisations. There is also international law that your country has to abide by. The EU is not trying to “control” you. But, please, if you do not enjoy your country being a member-state of the EU then get the hell out. While you are doing that, you can ask yourself why in no other country does the population have such attitudes (except, of course, for fringe idiots, equivalent to the BNP or other extremists). Why does no other member-state of the EU share British “eurosceptic” positions, why do you not hear this stuff from the population in other EU countries? But, please do not blame the EU for the fact that the UK is still a member (albeit in the second tier). We in the rest of the EU would be very happy for you to go away. Your politicians and your business leaders are the ones who want to keep you in, because they are aware of what a crappy situation your country would be in if it were to leave the EU. I fully support Scottish Independence if they want it but statistics don’t agree with you. I just hope they take all the Scottish MP’s along with them when and if they depart. That’s good Vicky. Now, please, leave the EU. I fully support the UK withdrawing from the EU! I believe in self-determination – if Scotland wishes to go its own way then I wish you a genuine Good Luck. But please, can we stop insulting each other – “Little Englanders” gets us nowehere. Wg, your objection to the use of the term “Little Englanders” is inconsistent considering the nonsense you have said about the EU. In any case, I am glad we agree on UK membership of the EU – we both want the UK to leave. You should be happy that the Treaty of Lisbon foresees a process by which a member-state can leave the EU. Please use it. Oh – Article 50, I’m praying that we will use it. to culture and Identity !?? UA it is pretty much a given to me that if we lose control of how we govern ourselves and have Brussels dictates interfering with out lives then our culture will change over the years. I could give you lots of examples but I have had too much of the ‘vino collapso’ which seems to have induced a dyslexic keyboard. The same applies to Identity, as in my humble opinion Brussels will not be happy till we are all singing the EU anthem (I know, they still have to put words to it, we are waiting for the French to write them). Well then UA if Draghi says that it must be true. I do hope you are right for all our sakes and that Mrs Merkel supports him because it is far from a given that the Euro of 17 will stay 17 or indeed if it will shrink to say 13 or, collapse totally. Please accept my word for it that I hope you manage to resuscitate the patient. It really is a worry though that the patient has been sick for so long without remedial treatment being administered. UA you would need to be living on the planet Zog not to realise that this European Project is about ultimately a Federal State, a Confederation will not be tolerated as that would give the Nation States to much power. It has been stated over and over again and I believe that it was recently stated in the European Parliament by Barrossa. So, you work for the EU construct then. I haven’t insulted you, I have made some derogatory statements about the Brussels establishment. You have taken it personally and so – you and the Brussels crowd must be one and the same. On the subject of a worldwide economic crisis – the crisis doesn’t seem to have reached Brussels, does it? You are correct though – it is our politicians and businesses that have got us into this mess. We need to have a cull of politicians, cut back on NGOs, and reign in the banks. Strange how the people suffer and not the EU apparatchiks and their banker friends. Thankyou and sorry to have offended you! Nor are a federal state because the EU cannot interene to sovereignity of nation state ! The EU has basically no Governance power! And again thas not the fault of the EU nor the UK or Benelux or De when southern Countries are depth up their necks! Thanks to the former Zapatero in Spain! Yes I’m living not as you described somewhere in the the Eu. Don’t you believe that infact that is more likely YOU that you are coming from the Planet Zog by ignoring that we are a step behind a confederation because the missing political Union , n’est-ce pas? But you are right Britain will leave the EU despite of all rising Business problems !! You will get a referenduk for leaving the EU! Yes you have a bunch of Eurosceptizism that we don’t need here in Europe in interests of Britain and perhaps this divorce will let Europe release the handbrake towards more Integration! We tend to argue our points fairly strongly on our Island and I hope that I have not offended you and can confirm that I have fairly thick skin, so I have not been offended in any way. The EU has basically no Governance power! Unquote. Quote: The founding treaties state that all member states are indivisibly Sovereign and of equal value. However, the EU does follow a supranational system (similar to federalism) in nearly all areas (previously limited to European Community matters). Combined sovereignty is delegated by each member to the institutions in return for representation within those institutions. This practice is often referred to as “pooling of sovereignty”. Those institutions are then empowered to make laws and execute them at a European level. If a state fails to comply with the law of the European Union, it may be fined or have funds withdrawn. In extreme cases, there are provisions for the voting rights or membership of a state to be suspended. Unquote. The only way that any state can regain sovereignty already given away by the various treaties is to leave the EU. This why many of us believe our Prime Minister, David Cameron, is wrong to promise repatriation of some powers back to the UK. What is so wrong about this Mr Le Pen is that most citizens go about their daily business, trying to earn a living, look after their families and do not realise what is being given away when treaties are signed. No we are not idiots as usually the bullet points are remembered, but I for one will openly admit that I had no idea what was entailed when the Lisbon Treaty was signed. We gained an opt out from the European Justice and Home Affairs part of the treaty and I was horrified when I realised just how much had been (nearly) given away in our name. Lets call it creeping Federalism! Like you I really feel for the people of Southern Europe and in particular Greece. If she had not joined the EU she would have been better able to have handled the world recession. However the EU and the member states (including the UK) should hang their collective heads in shame because Greece never ever met the criteria and it was clearly political and part of the ‘Great Project’. I can understand the need for Europeans to want the EU to succeed but it should worry the hell out of them when they look at what has happened over the past 12 years. Clearly political and economic incompetence has triumphed over common sense. I hope you are right and that we will be given the opportunity to comment in a referendum on our membership of the EU. Then, whatever happens, we must live with it. It is the democratic way. The EU was intended to be only six states , France , Germany , Netherlands , Belgium , Luxemburg and Italy . They were all neighbouring countries , that had been overun by Germany and defeated in WWII . Britain applied to join them , but was repeatedly blocked by General De Gaulle . Only after Ge Gaulle’s replacement did Britain succeed in joining . There was never any pre consultation of the people , Ted Heath took Britain into the EEC . The 1975 referendum had huge pro propaganda and speakers from Brussels . The public attitude in Britain was now we are in we might as well stay there . Ted Heath served only one term as PM and it grieved him the rest of his days that Britain and her people did not embrace the EEC as he had planned . I suspect that you don’t know the public attitude of other states . France and the Netherlands voted against the EU constitution . I have lived in Italy and can tell you that many people there share the British view of the EU . My daughter lives in Berlin , her husband works for the Foreign minister ; there are many Germans who are not euro enthusiasts . It is my experience that the general public in EU countries is very cowed , see little point in speaking out against government in the way that the British people do . I believe I am correct in saying that the EU is a Titanic , damaged beyond repair , fighting for survival , not to sink without trace . As Draghi says , the Euro cannot be withdrawn . The EU will have no recovery while the Euro remains a shared single currency . Even if a country like Germany can show a small amount of growth , it is collectively nullified by the shrinking of most other Eurozone economies . When austerity is being practiced across the EU , people stop buying , except for absolute necessities , so internal trade grinds to a halt . The Titanic was long ago and was BRITISH! IT may be rather UK will be again the new TITANIC leaving the EU !! Simple! there are other plans if such a worse scenario occurs! Well!We will see Britain in future crying themselves isolated with dept from the EU ! So glad to make you laugh ! The EU doesn’t admit to any possibility that it has run its time , or thar there is a plan “B” or “C”. As you are enlightened ” There are other plans if such a worse scenario occurs!” Perhaps you could tell us about them ? People forget that the British are island people , we have no sense of isolation , as would an European mainland country if it were politically separated from the EU . British people have no sense of attachment to the EU or mainland Europe . We have no sense of Allegence , loyalty to the EU . That has nothing to do with friendships we have across the European continent . If we were reduced to being little sheep and cattle farmers , like crofters in the isles we would be happy , as long as we were free from the Evil clutches of the EU . We want our exclusive fishing waters back , to govern ourselves in our own way , to abide by British Common Law and not be answerable to any EU or Roman law . I believe I’m correct in saying that whatever any country imports from outside the EU , the EU set a tariff . You can do a deal with a developing country to to buy bananas , but you pay extra to the EU . I believe many countries could trade better around the world if they were independent of the EU . The EU is no longer a simple free trade area as it started out to be ; it is now a political entity that overides any other consideration , including the population of the member states . wow! What a marvellous debate has been had while I’ve been looking the other way. I’ve enjoyed reading every post above, and been heartened to see the strength of feeling among my fellow EU-sceptics. Briefly, I’d like to add my support to everything that Mr Barneby, George Mc, wg and Vicky George have written. It’s interesting, is it not, that (apart from one fellow who had a bit of a rant early on) all of the anti-EU postings have been in calm and measured tones, with reasoned argument, while our ‘opposition’ has resorted to accusations, unsubstantiated statements, and ridicule? My answer is simply that ‘EU membership’ and ‘working with our neighbours’ are not exclusive positions. We are quite capable of working with our neighbours whether they be on the continent of Europe or in the wider world. The EU nations cannot afford to put up barriers to trade between us as they need our market for their exports far more than we need theirs for ours. We have run a trade deficit with other EU countries for years, while running a surplus with the rest of the world. As an independent nation once more, we will be free to arrange our own trade agreements with the rest of the world on terms that we agree are in our best interests rather than what we are told by the EU is in our interests. The same goes for defence co-operation, and for diplomatic relationships. We will speak for ourselves, and not have some self-aggrandising (and profligate) EU ‘External Action Service’ telling the world whatever it wants and claiming to represent us. Many EU-philes like to point out that the head of the EUEAS is ‘the British Commissioner’ – conveniently forgetting that all Commissioners are obliged to act only in the interests of the EU, and to leave all national thoughts at the door when they are appointed. Note, appointed, not elected. They might actually be ignorant of the fact that Ashton has never, not once, been elected to public office, nor worked in the real world. A lifelong quango-crat, she now claims to speak for hundreds of millions of us, without ever having been chosen by an electorate. In the 1970s Great Britain was at a low ebb, and the bright new future presented to the people in the name of the ‘Common Market’, a wonderful trading club in which we could prosper with our lovely neighbours, would have seemed an improvement over the misery, the three-day week, the uncollected rubbish in the streets. The British people were not asked if they wanted to join, but were signed up by a Government that had no mandate to do so, on terms so unfavourable that the very next Government had to unpick the deal and try again. Only when a supposedly better deal was struck were the people asked to express their wishes in a referendum – which was fought on grossly uneven terms with huge state funding of the ‘yes’ campaign. We know now that the politicians of those times knew already that the ‘Common Market’ was intended to become ever more closely bound into a political union, and were therefore lying through their teeth every time they denied that future purpose. Anyone who could see it for what it was, was derided as a crank, a xenophobe, a ‘Little Englander’ – terms that seem remarkably familiar having read the discussion above. And yet now we can see that they were right all along – the CM has morphed ever closer to the USofE that Monnet and Schumann had wanted, that was promoted by Mitterand and Kohl, by Delors, by Giscard d’Estaing in his ‘Constitution’. The British people have never been asked if we want to be a part of a political union. None of the peoples of Europe have ever said ‘yes’ when asked if they want it either – the Dutch and French referenda on the ‘Constitution’ both rejected it, which is why it was transposed into unreadable technical gobbledegook and called the ‘Treaty of Lisbon’. Even that couldn’t be passed without bullying the Irish into having a second go at a referendum – and I bet they’re now delighted that they gave in, aren’t they? As David said above, we are an island people – despite all the interconnectedness of the modern world, we still value our independence. We haven’t been overrun by force of arms for nearly a thousand years, and have never shared the fears of our continental neighbours of who might decide next to walk across the border with a loaded gun. Indeed, we’ve saved them from each other more times than many of them would care to recall. Consequently, we don’t feel any need to tie ourselves to supra-national governance, nor to ‘pool our sovereignty’ with any of our neighbours. I love Europe as a place, I have a great many friends in France, the Netherlands, Germany, Denmark, Norway, Spain, Italy, Switzerland – but also across the world from New Zealand to Argentina to Ecuador to Canada. I speak Spanish almost fluently, ok so my French takes a few days to come back up each time I go there, and I’m in my second year of studying Italian as an evening class. My girlfriend is Portuguese. If anyone ever calls me ‘isolationist’ or ‘xenophobic’, I can point to any of this and laugh at their baseless accusation. But, I am not European other than geographically. I bear no loyalty to the EU, indeed It pains me to see the damage it is doing to so many of my friends. I accept that some of them even like the EU and are happy to see their countries ruled collectively from Brussels under the ring of stars – but such collectivisation is not for me, nor, I believe, for a great majority of the British people. Thanks , a wonderful post , you say it all so precisely !!! I guess David Cameron is currently stiring the S. hit in Brussels. Good post Adrian, you have pulled it all together nicely.